Walton-on-Thames starring role in 1749! Frederick Lewis, son of George II, the Prince of Wales (see below) played the first ever documented game of baseball more than 250 years ago - right here in Walton-on-Thames! A prominent member of the British royal family played baseball more than 250 years ago. This is according to the latest discovery of SABR member and author David Block, who specialises in the study of baseball’s origins. 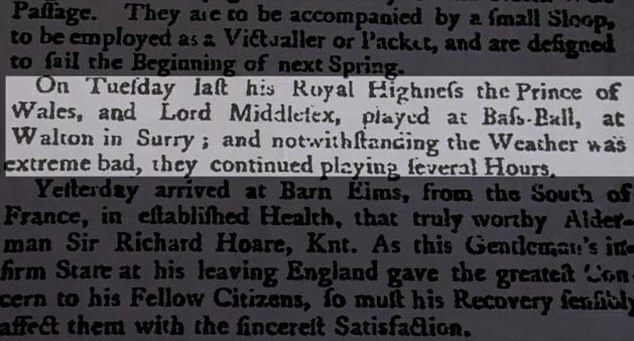 Combing through an obscure 1749 newspaper, Block spotted the following news item: “On Tuesday last, his Royal Highness the Prince of Wales, and Lord Middlesex, played at Bass-Ball (sic), at Walton in Surry (sic); notwithstanding the Weather was extreme (sic) bad, they continued playing several Hours." Though Block and other baseball historians have long been aware that the game originated in Britain before migrating to the North American colonies, this discovery overturns their assumption that it was played only by children and young adults. Frederick, the Prince of Wales, and his playing partner Charles Sackville, (1711-1769), Earl of Middlesex were not only members of the aristocracy, but also men entering their early middle age. Surrey County Council’s archivists at Surrey History Centre identified the area where the game was played in Walton-on-Thames as Ashley Park. Sackville’s wife, Grace Boyle, had inherited the property from her parents in 1740 and the park, described by Owen Manning and William Bray in their History and Antiquities of Surrey as 'a capital mansion with a park of 136 acres' is shown in some detail on a John Rocque’s 1762 map of Surrey, held at Surrey History Centre. William Bray was himself no stranger to baseball. His reference to playing the game in his diary entry for Easter Monday, 1755, remains the earliest known manuscript reference to the game. Block uncovered this baseball reference in The Whitehall Evening Post for 19 September 1749. Curiously, it is not the first time Frederick’s name has been associated with the game. The Prince may have played it on 13 November 1748 together with his 10-year-old son George, who 12 years later would be crowned George III of England. Lady Hervey, a well-known 18th-century courtier, is believed to have described it in a letter. However, the letter is not known to have survived in its original form. 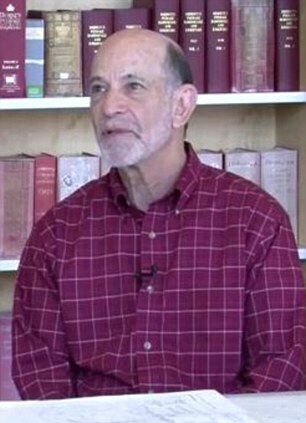 David Block announced his discovery at the Surrey History Centre in June 2013. Julian Pooley, Head of Public Services at Surrey History Centre, commented: The discovery of this very early reference to baseball in Surrey is particularly exciting given the county’s rich and varied sporting history. From the earliest reference to cricket in the Guildford borough records, William Bray’s diary reference to baseball in 1755 through to the battle of the Somme, when the 8th battalion of the East Surrey Regiment charged across no-man’s land kicking footballs in front of them, sport has played a major part in Surrey’s history. Baseball in mid-18th-century England would have looked very different than modern American baseball. Block’s analysis of dozens of references to English baseball from the 18th and 19th centuries suggests that the game would have been played on a smaller scale than the modern pastime, with shorter distances between the bases and with the pitcher standing much closer to the batter. It was also a game that required less athleticism. The ball was much softer than today’s; and instead of a bat, the palm of the batter’s hand was used to strike the ball. After hitting a ball, a batter could be retired if a fielder was able to catch the ball on the fly, or retrieve it and strike a runner with it before the latter reached base. Yet despite these differences, the basic elements of 18th-century English baseball — pitching, batting, base- running and fielding — were comparable to those found in its later American namesake, and Block believes there is little doubt that English game was the forerunner of the modern American pastime. According to Block, the issue of The Whitehall Evening Post in which he found the article about the Prince of Wales can be found in the collections of several libraries in the U.S. and the U.K. These may, in fact, be the oldest documents to mention the game of baseball that still actually exist. Two earlier references to the game, including the aforementioned 1748 letter by Lady Hervey, are not known to have survived in their original form. Block found a handwritten copy of Lady Hervey’s letter, probably made later in the 18th century, in an archive in Suffolk, England, and her collected letters, including the one mentioning baseball, were published in 1821. An even earlier reference to baseball probably appeared in a children’s book, A Little Pretty Pocket-book, that was first published in 1744. However, the earliest known surviving copy of that book is a 1760 edition in the British Library. Block is the author of the 2005 book Baseball Before We Knew It published by University of Nebraska Press, and the new, 2019 book Pastime Lost: The Humble, Original, and Now Completely Forgotten Game of English Baseball. He is also a member of Major League Baseball’s “Baseball Origins Committee” under the chairmanship of MLB’s Official Baseball Historian, John Thorn. In 2013, Surrey County Council stated, 'Baseball is an integral part of American life and this news about a national obsession in the US, where home grown sports have traditionally dominated, will reverberate far and wide. It is a game steeped in history and now the Surrey County Council's History Centre and the inquisitive historians David Block, Tricia St. John Barry and Julian Pooley have provided the earliest manuscript proof that the game the Americans gave to the world came from England'.